It’s been a long journey and we are now more than just 3 blind mice! The team has grown, product offerings have evolved, and the company has now been recognized for this tremendous growth by the San Diego Business Journal, ranked by percent of verified revenue growth from 2011 to 2013. 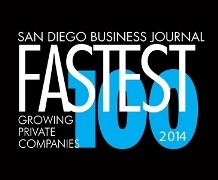 Appearing one behind the local San Diego favorite, Stone Brewing Company, it is quite an honor to receive the award for being one of the 100 Fastest Growing Private Companies in San Diego. With that being said, we met many rising companies at the Paradise Point Resort & Spa on July 10th, 2014 and wanted to share some of the photographs we took from the event of our representatives Julie Burcham, Joani Hurn, Jennie Campbell, and Scott Dietz. Without our hard working team and strong loyal customer base, we would not be in this period of expansion. The past few years have put 3 Blind Mice Window Coverings in a position to provide great value for our customers and offer opportunities for advancement with the team. Help us share the good word by referring a friend, you will even receive a $50 gift card if they become a customer. Please refer a friend if you have had positive experiences with our customer service staff, installation team, or knowledgeable showroom employee. Receive a $50 gift card for referring a customer.